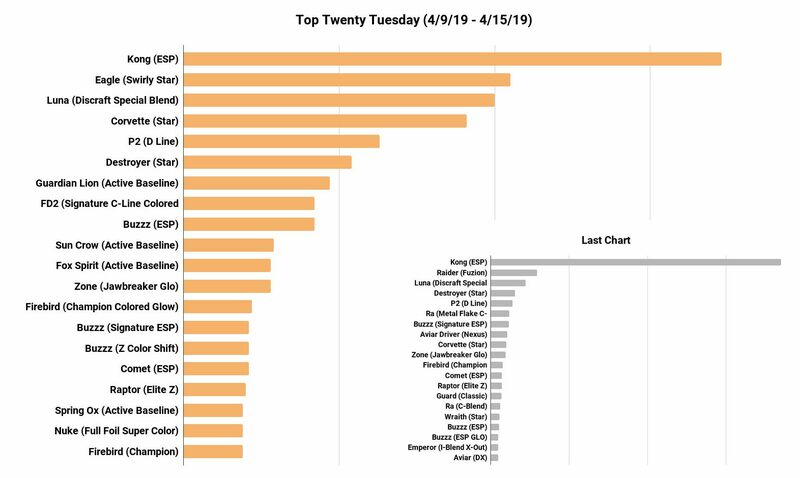 The Star Destroyer absolutely destroyed the chart, wiping out any other top contenders in this week’s sales. A lot of that has to do with the fact that we got a big restock of Ricky Wysocki Destroyers, while we ran out of Paul McBeth signature discs. 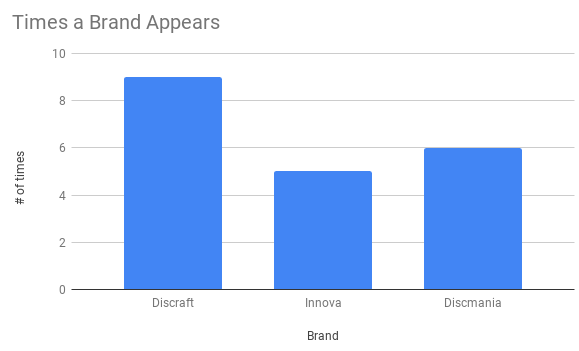 More of those are coming from Discraft soon, so the numbers should swing a bit in that regard. 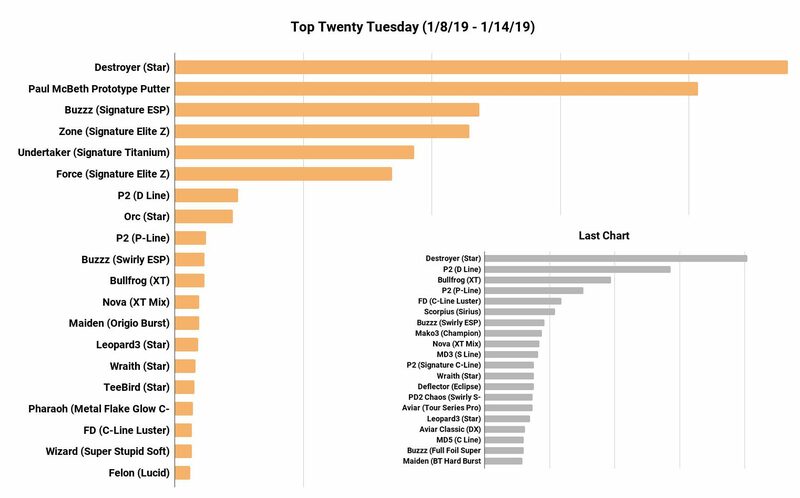 We see a couple of X-Out (factory 2nd) entries into the chart this week as well as we also got a big restock of misprints and factory 2nd discs from Innova. 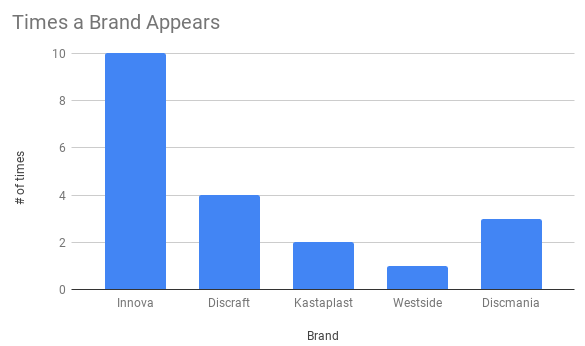 Another restock that made a splash was the much needed restock of Kastaplast discs, boosting both the Reko and Berg putters into the top 20 for this week. 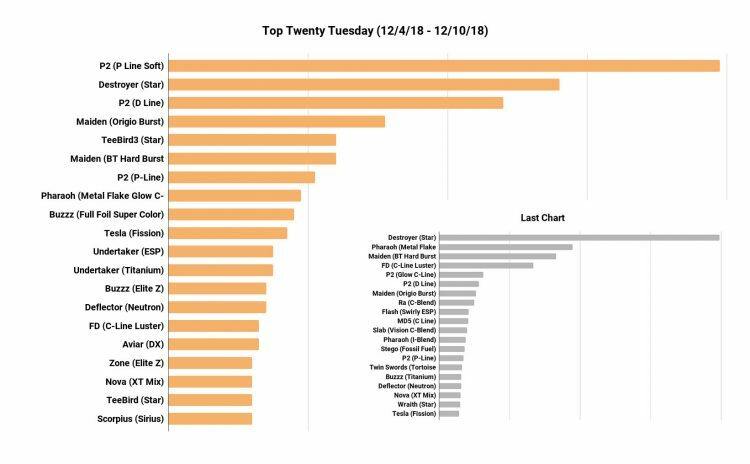 WINNER – The #12 spot was the pick for this week’s chart and we saw four people get it right with the XT Mix Nova as their guess. We’ll go ahead and give those four people the gift card for this week. But get your guess in early because we’re going to make sure we only pick three if there are a lot of same guesses coming in the future. Congratulations Steven, Dawson, Drew, and Matthew! GIFT CARD PREDICTION FOR NEXT WEEK: Leave your comment below this blog to predict the #20 spot for next week’s chart. 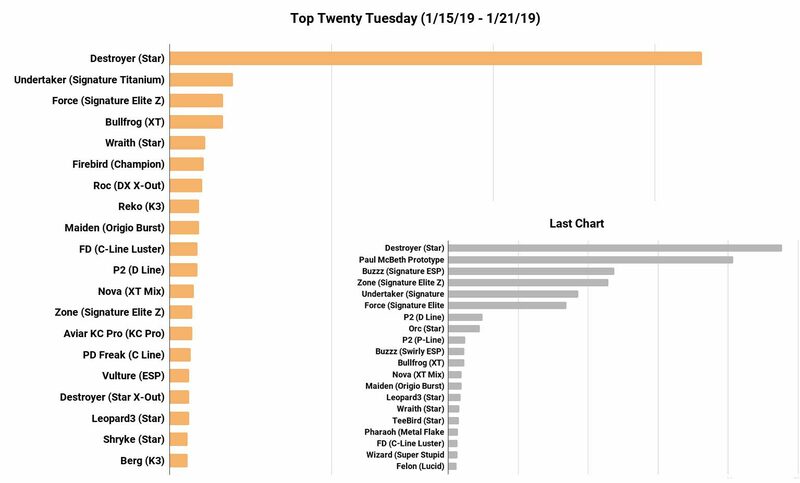 Well, we took longer to get back to the Top Twenty Tuesday chart than expected, thanks to the crazy holiday season. But here we go with a chart that represents everything since December 18th. 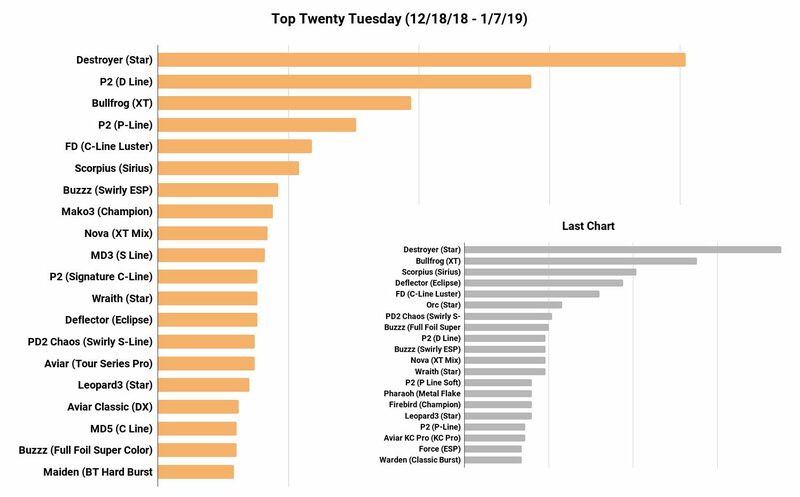 The P2 and Destroyer have kept a strong presence at the top of the chart through the holidays, and the new Bullfrog flat-topped putter from Innova moved to the number 3 spot. The Scorpius by Millennium discs is holding strong at number 6, thanks to Gregg Barsby’s hot signature edition. 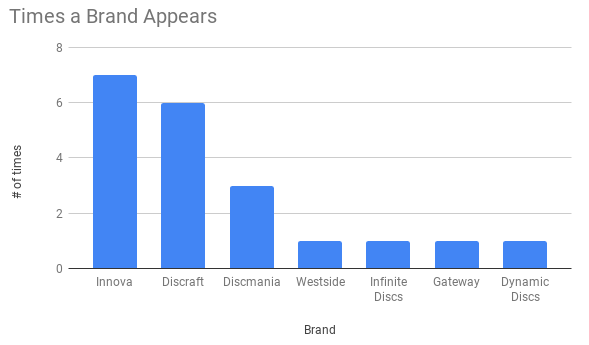 We can see a lot of discs hanging around that have been regulars in the chart, plus a few of the special editions still getting some love. 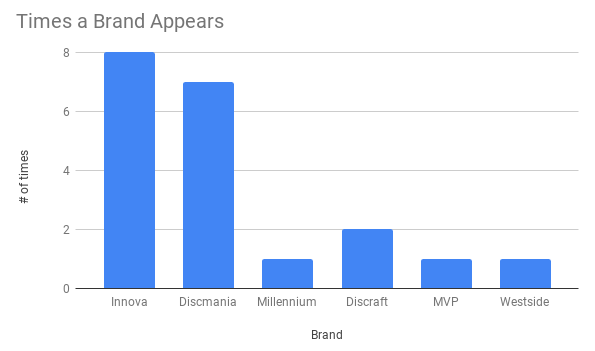 In case you are interested, here is a little chart that compares how many time each brand appeared on this week’s chart. 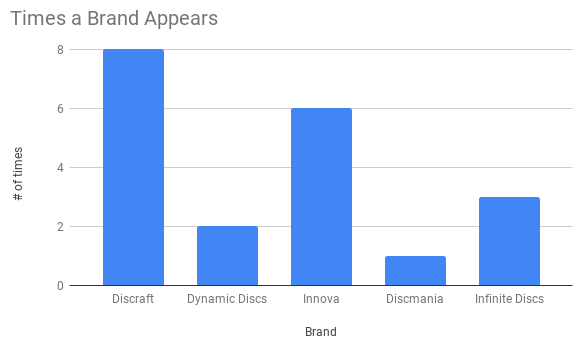 We expect to see some Discraft discs spiking the charts in the coming weeks as Paul McBeth signature discs are introduced to the market. With the holidays over, keep an eye on this blog for regular weekly charts. WINNER – There were actually five people who guess the #3 position for this return chart. Since it has been three weeks, we’ll go ahead and award all five with a gift card. Congratulations Steven, Matthew, Ryan, Kyle, and Matthew! The Bullfrog was the winning guess. GIFT CARD PREDICTION FOR NEXT WEEK: Leave your comment below this blog to predict the #7 spot for next week’s chart. 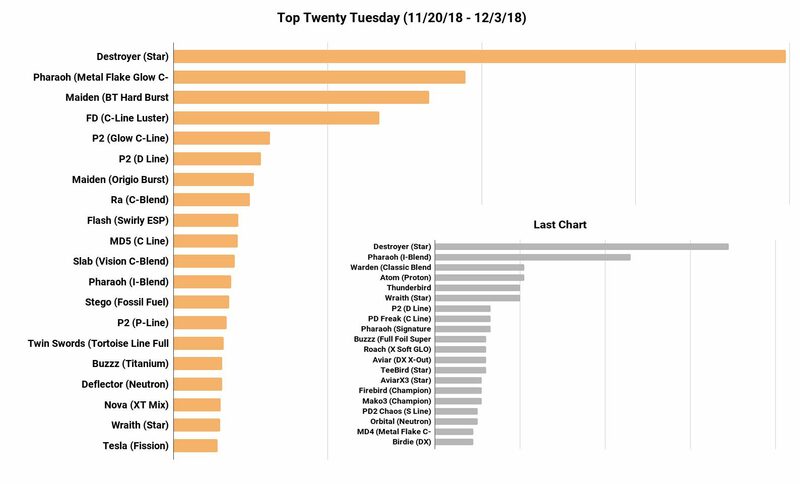 The chart covering the last two weeks of sales at Infinite Discs is HIGHLY influenced by Black Friday deals that carried through an entire week of sales and special disc releases. The Star Destroyer held the number one spot with several special edition stamps on black Destroyers released on Black Friday. The 2nd place spot goes to the Metal Flake Glow C-Blend Pharaoh which really got a lot of love with the cool combination of colored glow and metal flake in the plastic blend, plus the XXL stamp designed by Thought Space Athletics. In a strong 3rd place showing was the limited run of BT Hard Burst Moonshine (glow) MAIDEN putters– a run that was made especially for Infinite Discs. The original Origio Burst Maiden also had a great showing at #7, showing that this latest putter from Westside disc has been a big attention-grabber since it was featured in the 2018 Trilogy Challenge tournaments. Also with big showings due to special editions, the C-Line Luster FD and Glow C-Line P2 discs from Discmania were a big hit, as were the special run of Swirly ESP Flash discs– an older Discraft mold that many players have been missing since it was discontinued. The Stego by Reptilian Disc Gold and the full-color Twin Swords by Yikun made strong showings for smaller brands. Infinite Discs also saw the new release of the C-Blend RA with the XXL stamp his #8 and the Vision C-Blend (full color) SLAB hit the number #11 spot with its dramatic stamp image which was placed to leave a grip edge around the outside top of the flight plate. WINNER! 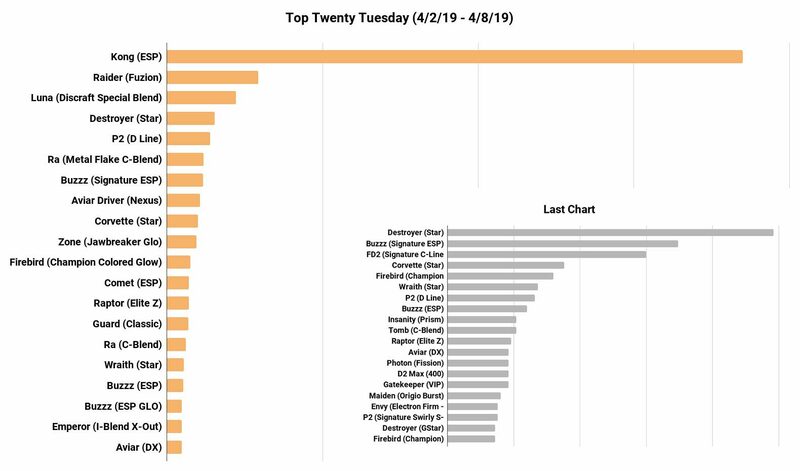 – We didn’t get a lot of guesses for this week’s #2 position, but we do have a winner. Garrett Colwell declared “Metal flake pharaoh all the way up!” and that is close enough to “Metal Flake Glow C-Blend Pharaoh” that we’re handing him the win. Congratulations Garrett! 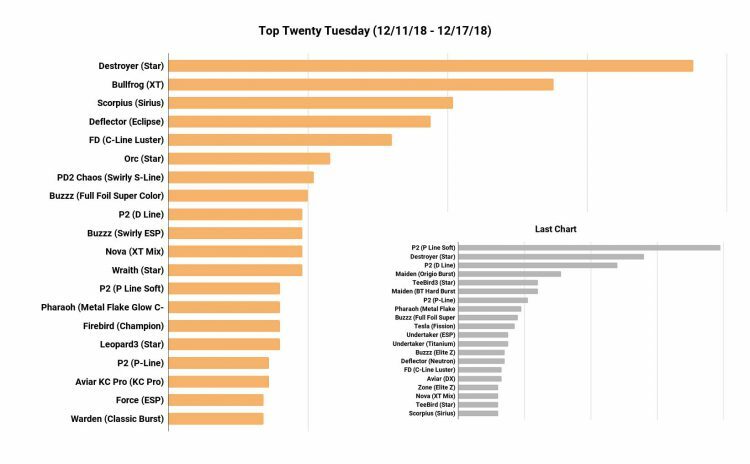 GIFT CARD PREDICTION FOR NEXT WEEK: Leave your comment below this blog to predict the #5 spot for next week’s “Top Twenty Tuesday” chart. Have fun!